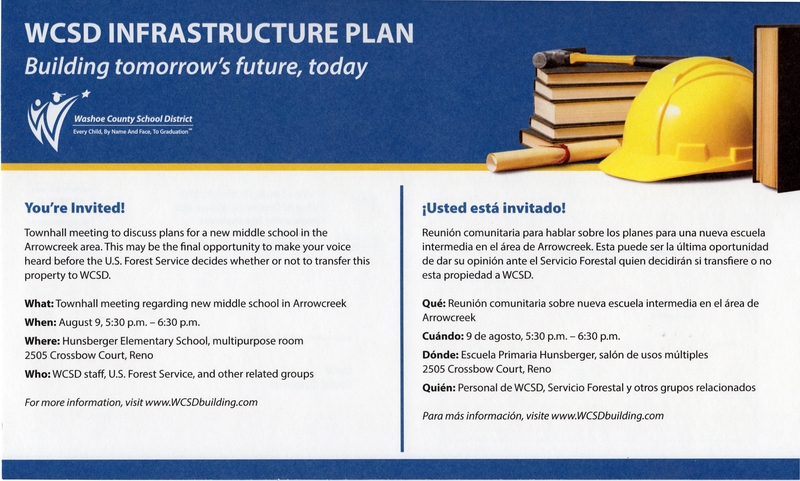 On Thursday, August 9, 2018, 5:30-6:30 pm, there will be a townhall meeting in the Hunsberger Elementary School multipurpose room (2505 Crossbow Ct., Reno) to discuss plans for a new middle school in the Arrowcreek area. Parents need to come to show their support for the project to relieve overcrowding at area middle and elementary schools and to accommodate projected growth in the area. Make Your Voice Heard: Middle School in Arrowcreek. Due to an objection to the project, the US Forest Service is delaying the land transfer another 30 days, and is required to hold another public meeting, with WCSD. This may be your last opportunity to share your thoughts on this proposed new middle school project before the USFS makes their decision on whether or not to transfer the land to WCSD for the school. Here is the latest Interested Parties letter from the U.S. Forest Service. 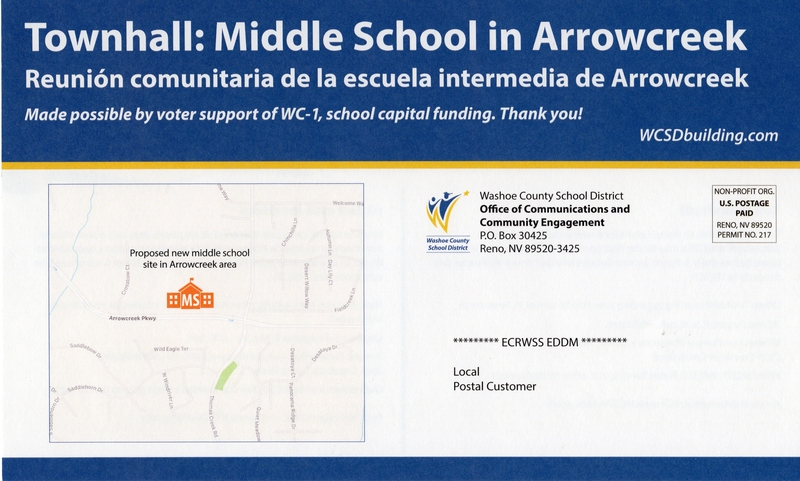 This entry was posted in Arrowcreek Middle School, Washoe County School District and tagged Arrowcreek Middle School, Arrowcreek Middle School Townhall, WCSD Infrastructure Plan. Bookmark the permalink.